Registered nurses (RNs) perform various roles in the field of health care and occupy different jobs. RNs generally work as staff nurses in hospitals and medical centers. There are those, however, who have pursued higher learning and trained in special clinical fields. Others worked in not-so-traditional settings. Still, others have explored nonclinical healthcare-related careers, such as those in hospital administration and the academe. As such, they have mastered special competencies and advanced as nurses. These nurses are better paid, too, than their counterparts who have opted to remain in their traditional roles. A Staff Nurse-RN makes a median annual salary of $69,136; let’s see the median annual salaries of the ten highest paying nursing jobs in the world. Often also called Chief Nursing Executives or VP for Nursing, Chief Nursing Officers earn a median annual salary of $196,112. To become one, a RN must have completed graduate studies in nursing, extensive clinical experience, and certification from the appropriate regulating body, such as the American Organization of Nurse Executives if working in the US. Chief Nursing Officers are vital in medical and health care industries. They are decision-makers with competencies in administrative leadership, management expertise, and strategic planning. They perform a variety of tasks that include overseeing daily operations of nursing departments, recruitment and retention of nurses, improving patient care, enhancement of nursing policies and staff relations, and maintaining regulations and faithful compliance with laws. They usually report to top management. CRNAs are highly-trained nurses who work alongside medical and nursing personnel all through medical procedures requiring anaesthesia. They make a median annual base salary of $164,791. Variation in salary within this occupation category depends on several factors, such as years of experience, level of education, kind of industry, company size, and geographic setting. To become a CRNA, a RN must have completed specialized graduate level Master’s degrees. In most countries, they need to be certified by a regulating body. In the US, these are the Council on Accreditation of Nurse Anaesthesia Educational Programs and the American Association of Nurse Anaesthetists. They are also called Nurse Practitioners – Neonatal (NP-Neonatal) and make a median annual salary of $107,003. To qualify, a nurse must have a master’s degree and certification as a Certified Neonatal Nurse Practitioner. There is a high demand for this particular job that is specifically for the care of newborns not more than 28 days old and premature infants. A neonatal nurse works closely with a physician (to whom the nurse regularly reports to) to gauge the physical needs of newborns; prescribes and administers medication, oxygen, and other therapeutic procedures, interprets and records clinical tests and conveys results to physicians. Extensive knowledge and proficiency in critical infant care is vital, especially when working in the neonatal intensive care unit (NICU). Alternate job titles of Nurse Managers are Nurse Administrators and Head Nurse. They earn a median annual basic salary of $96,680. This position requires finishing a post-graduate degree in nursing, with at least 5 years of clinical work experience in a related field. Job aspirants must possess the qualities of a good leader and a strategic planner to set up effective measures of improving patient care, and the expertise in human resource management. Specifically, the functions include overseeing recruitment, hiring, training of personnel, and managing the business side of the organization. Nurse Managers are normally accountable to top management. NPs are experienced nursing professionals who are graduates of intensive Master’s degree programs specializing in geriatric, family, or pediatric nursing and are Certified Registered Nurse Practitioners (CRNP). The NP-Neonatal mentioned as item number 3 is a sub-specialization of this genre. Generally, NPs analyze and treat patients independently but in collaboration with other medical or healthcare practitioners. They report to the manager or head of a unit or department. They earn a median annual salary of $96,612. They perform a range of responsibilities – such as, ensuring proper care and attention to illness, injury, and disease prevention – by providing diagnostics, treatment, and recovery procedures. To gain employment as a CNS, one has to be a graduate of Master’s or Doctoral degree in nursing and duly certified by a regulating body, such as the American Association of Colleges of Nursing and the National Association of Clinical Nurse Specialists in the US. Some healthcare or medical facilities require no less than 5 years of experience in the appropriate discipline or other related areas. A typical CNS makes a median annual salary of $96,281.CNS jobholders extend their clinical expertise in various settings or for a range of diseases, and in just about any health problem including wound care, pain management, emergency room situations, women’s wellbeing, geriatrics, paediatrics, physical therapy and rehabilitation, and many more. A CNS also acts as a consultant for nursing personnel and outlines methods for improving the delivery of healthcare services. CNMs, also called Nurse Midwives, provide professional care and services to women patients with obstetric and gynaecological needs and assist them through the stages of contraception, conception, delivery, post-partum care, newborn and family care, and proper education. Nurse midwives generally make a median annual salary of $95,183. A CNM aspirant has to complete an accredited master’s degree program and undergo 2-4 years of clinical experience in this particular field before acquiring the appropriate certification to practice. In the US, the American Midwifery Certification Board regulates CNMs. A nurse midwife usually works in collaboration with a practicing physician and reports to a supervisor or manager. Nurses in the academe earn a median annual salary of $85,585. They are also sometimes called Nursing Education Coordinator or Nursing Educator. Before they can be employed in such job responsibilities, they are required to be certified first by the National League of Nursing. They often have a master’s degree in nursing and long years of training and experience in their field of expertise. Nurse Researchers earn slightly higher than RNs in the mainstream clinical environment at a median annual salary base of $75,215. Their responsibilities include collecting and analysing health-related data. They may find work with companies that engage in the industry of pharmaceuticals, equipment and other medical products, or organizations that study policies for possible breakthroughs in nursing or medical methods and systems. RN’s are required to have a minimum of a master’s degree to gain entry to these jobs, and pursue doctorate degrees to advance to higher research positions. RNs working in home cares actually earn more than RNs in hospitals and the regular health care system. They take various job titles, such as Staff Nurse – Home Care, Staff Nurse – RN – Home Care, among others. They earn a median annual salary of $72,571. They work with physicians and other health care professionals, and report to the manager or chief of a unit in a home care facility. Nurses don’t just wear different caps; with experience and advanced training, they also expand their job potentials. If you’re an RN, there’s enough room for you to grow in your career and earn handsome salaries along the way. 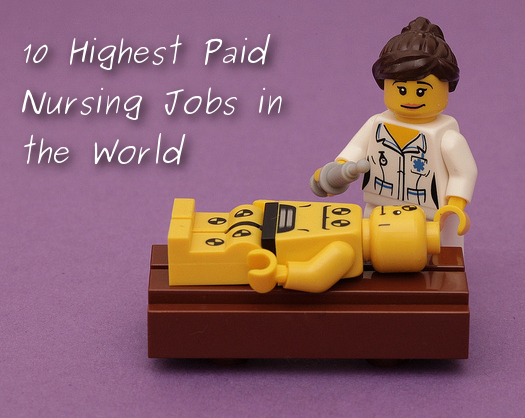 I hope this helps you find the highest paying nursing jobs in the world.